Before construction couid také place, the investor searched for a good plot of land for several years. It is located at the edge of an extraordinarily well-preserved village, on a southern slope offeringfar-reachingviews.There ušed to be a stone barn on dirt foundations.The stone was saved for later use, and the other materiál was used to level the grade to create terraces. The homestead is spatially defined by three structures - a shelter at the gate, the house proper and an abutment wall with a gazebo as well as planted grown trees. The house, with the service facilities, forms a single unit sub- divided into four longitudinal functional zones. The first zóně contains the live-in rooms facing the south, with an exit into the garden - the living room with a studio in the attic, the kitchen and bedroom. The second zone comprises amenities - pantry, black kitchen with a service entrance, bathrooms and a laundry room. The farmyard forms the third zone,while thefourth consists ofthe outhouse. The entire concept ofthe house stresses an intimate relationship with nátuře and sensitive contact with various materials like wood, stone, smooth cement finish concrete, as well as raw iron. 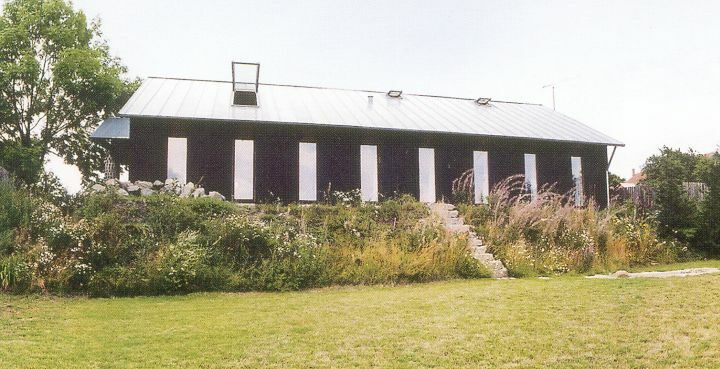 The house is built from brick, partly over the barn foundations, with wood beam ceilings. The roof truss over the studio is arched by means of steel rods. The exterior wooden cladding heips place the house into the landscape and has good resistance to the climate at 500 m a.s.l.. The heated areas are thermally insulated on the exterior. Therefore, the house manifests low heat losses and a great accumulation capacity. Electrical floor heating is used for heating.